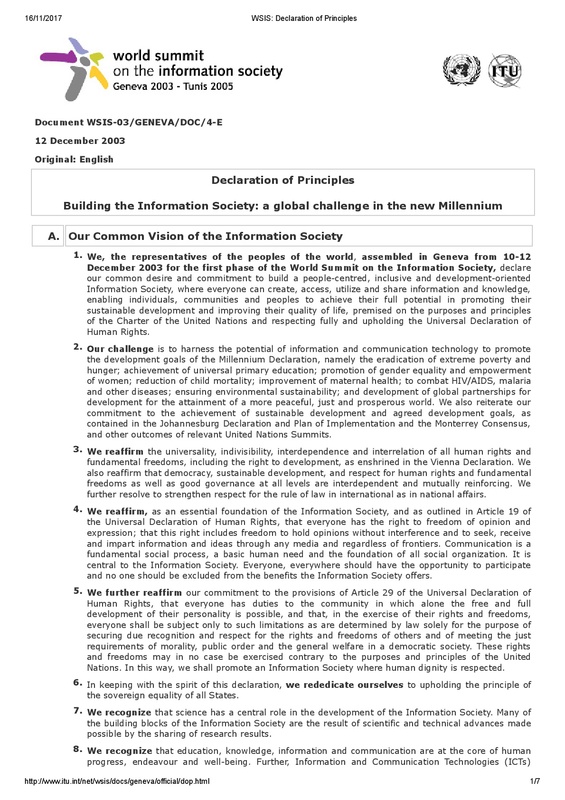 The WSIS Geneva Declaration of Principles, titled “Building the Information Society: A Global Challenge in the New Millennium” was adopted by world leaders gathered at the Geneva Phase of the World Summit on the Information Society on 12 December 2003. It lays the principles on which the emerging Information Society will be founded. International Telecommunication Union, “Declaration of Principles: Building the Information Society: a global challenge in the new Millennium,” Curadoria Enap, acesso em 22 de abril de 2019, https://exposicao.enap.gov.br/items/show/285.